world-renowned bassist, composer, producer and award-winning educator, Tony Grey! as part of a highly structured, 2-year creative learning system. STUDY AT YOUR OWN PACE, FOR HOWEVER LONG YOU'D LIKE, WITH NO COMMITMENT. 30 DAYS. 60 DAYS. 90 DAYS. 1-YEAR. 2-YEARS. 10-YEARS. UP TO YOU! DESIGNED TO MEET THE NEEDS OF BEGINNER, INTERMEDIATE AND ADVANCED STUDENTS. I’d always been on a quest to find the perfect book or system to help me become the musician I wanted to be. The problem I’d continuously encountered was that the lessons were structured very mechanically, which didn’t allow me to implement what I was studying into my playing in a way that felt natural or creative. 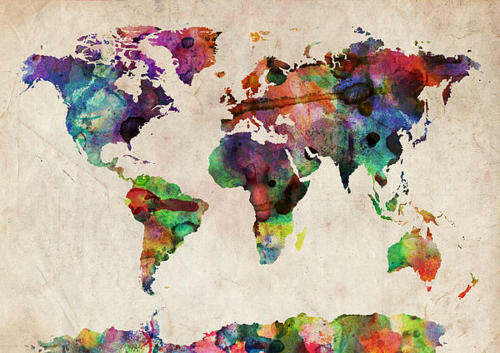 THE PHILOSOPHY BEHIND OUR CURRICULUM IS BASED PURELY IN CREATIVE LEARNING. WE CAN DEVELOP QUITE RAPIDLY BY LEARNING ACADEMIC THINGS IN A CREATIVE WAY. 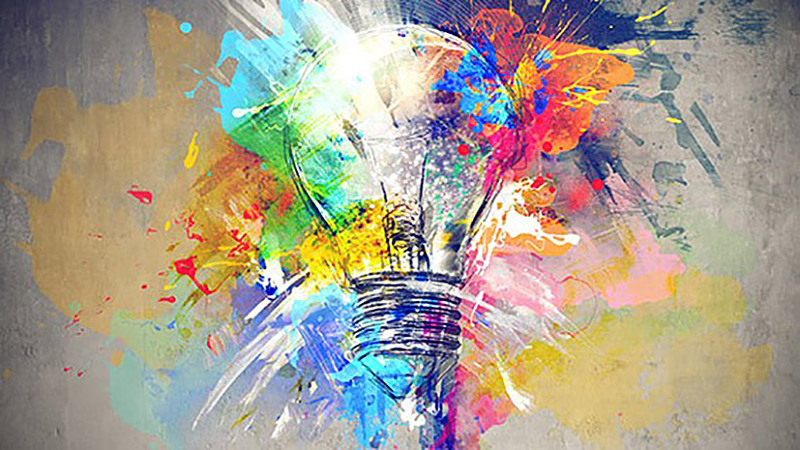 WHAT DOES CREATIVE LEARNING LOOK LIKE? If you’re learning a scale, instead of just learning it — learn how to make melodies with it, how to create bass lines with it, how to compose with it, how to improvise with it, and most importantly learn how to hear and feel it all over your instrument so that the only thing holding you back is the limitation of your own imagination. That's creative learning. ONCE YOU WORK THROUGH THE LESSONS IN THIS WAY YOU'LL NEVER HAVE TO BACKTRACK IN ORDER TO REFRESH IDEAS; YOU'RE JUST BUILDING YOUR VOCABULARY AS YOU MOVE FORWARD THROUGH THE COURSE MATERIAL. IN THE PROCESS YOU'LL LEARN TO DEVELOP YOUR OWN CREATIVE VOICE AS A MUSICIAN. "WHAT AM I MISSING AND WHERE DO I GO FROM HERE?" The Philosophy that stands behind our teachings encourages UNLEARNING everything you already know about music in order to RELEARN it in a creative way. THE DIFFERENCE YOU'LL SEE IN YOUR PLAYING WILL ASTOUND YOU! I appreciate the idea of relearning things. Imagine being able to relive your youth with all of the knowledge you'd accumulated over the years. Relearning the basics in a way that establishes good practice habits is absolutely essential in developing a solid foundation for thorough academic understanding and creative exploration. Otherwise we find ourselves trapped in old patterns that prevent us from tapping into any true self-expression and our improvisations end up becoming predictable and frustrating. Now that you have a better understanding of our approach to education and the Philosophy that we uphold, let's talk about how the curriculum is structured and why it will benefit you! ALL GOOD THO -- LIFE IS ABOUT LEARNING, NOT PAPER. From jazz to rock, we cover it all. Every month you're inside the Academy, you'll unlock new lesson content from each of the eleven chapters. In this way you'll gradually build a solid foundation so that you'll never have to go back and re-learn anything ever again. Your playing will soon become rooted in organic and creative growth, utilizing the fundamentals of music theory & application as if by second nature! Designed to educate and support musicians at any level to achieve their goals and dreams while assisting in the development of their own creative and unique voice! 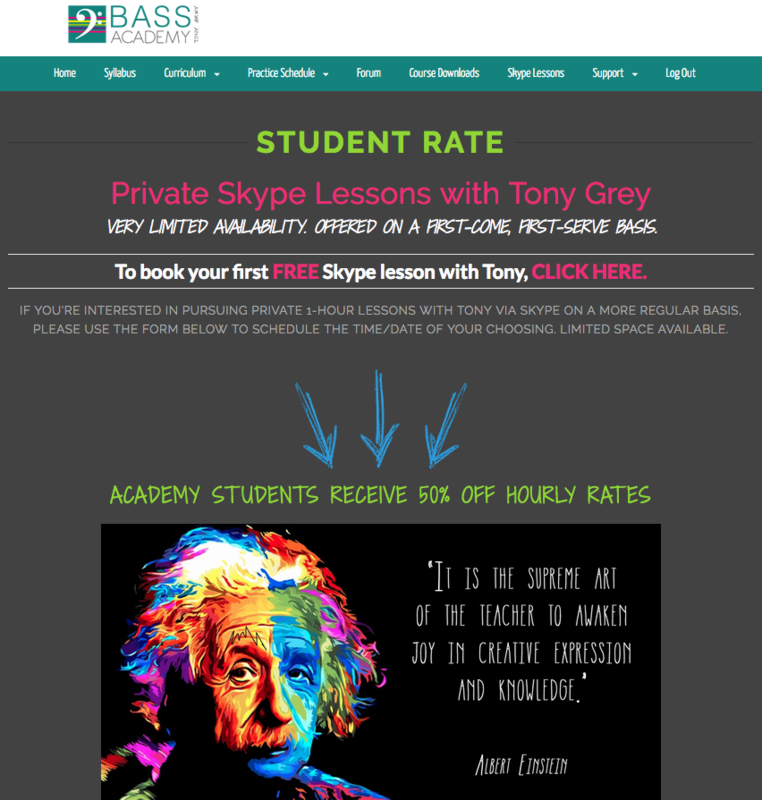 + YOU'LL RECEIVE A FREE 1-HOUR SKYPE LESSON WITH TONY! 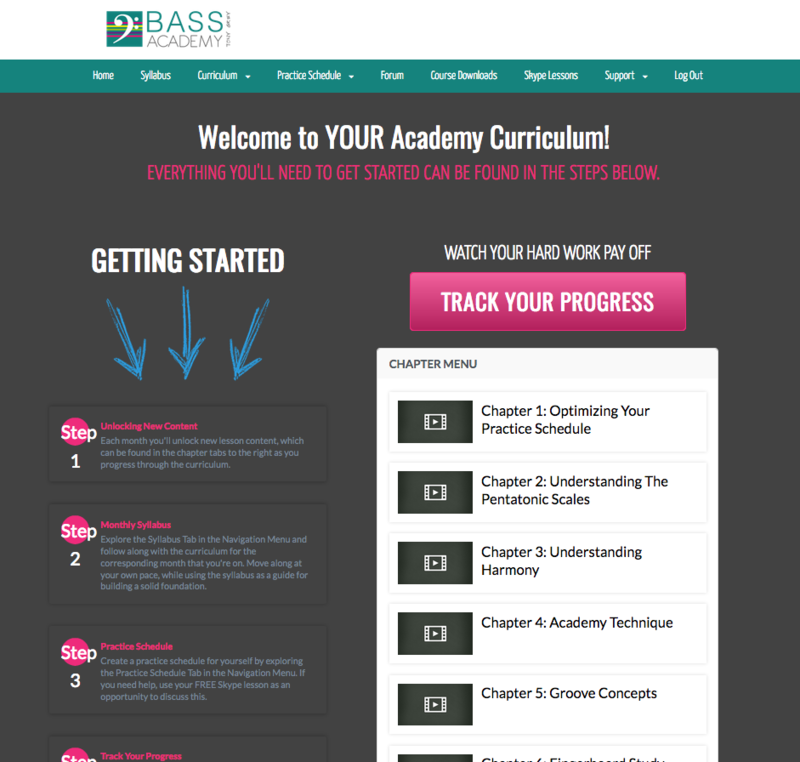 GET YOU COMFORTABLE WITH THE ACADEMY LAYOUT AND CURRICULUM. ASSESS YOUR CURRENT SKILL LEVEL & PERSONAL GOALS. HELP ESTABLISH A SOLID PRACTICE SCHEDULE THAT MEETS YOUR TIME RESTRAINTS. 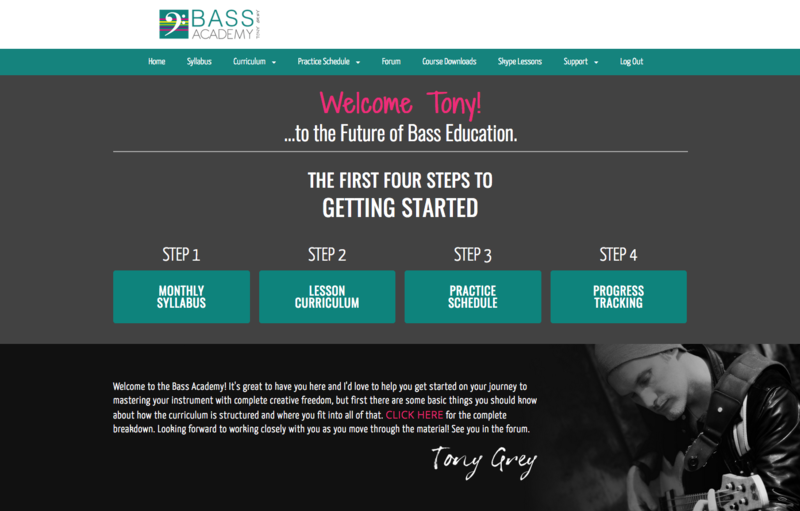 JOIN THE #1 ONLINE ACADEMY IN BASS EDUCATION.